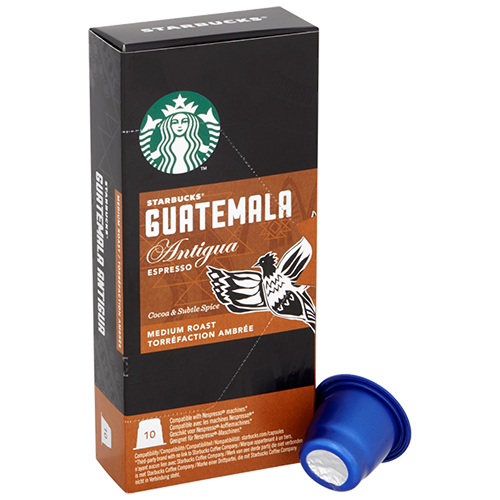 Starbucks Coffee Guatemala Antigua Espresso coffee capsules compatible with Nespresso are a coffee from the Antigua-valley in Guatemala. Antigua is a lush area in the southern central part of Guatemala, nestled among three volcanoes. Here the farmers have proud traditions when it comes to coffee growing, which results in consistent taste cup after cup. Starbucks Coffee Guatemala Antigua Espresso has a taste of lemon, chocolate and soft spices with an elegant taste that feels unique to this region.